Unsatisfied with three albums in one year, Frank Black fans from all over have organized themselves to give us even more 'Frank Black' to listen to! Come April, 2003, FB.net Forum member and organizer Dean Katsiris (Cult_Of_Frank) began organizing this project. By the end of June, he'd received over 40 submissions, which cumulated into this MP3 tribute 'album'. 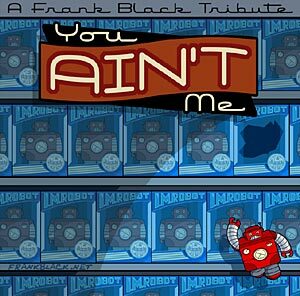 Below you'll find out how you can download this amazing effort from your fellow Frank Black fans. A big thank-you to Dean, as well as Tim, Ryan, and all the contributors to the CD, great job everyone! Visit the Frank Black Forum, sign up, then visit the FTP area. You will need an FTP client to download the album - check out the FTP FAQ for info on this if you need help. (Note: you will not be able to view the area until you sign up and log into the Forum.) The CD Cover and Tray Inserts, as done by Ryan Wiesbrock is located on the FTP as well. There are two groupings of songs - the ones selected for the 'Album', and all other contributions, which are listed as 'B-Sides'. They're all encoded as 192kbps MP3's, and the 'Album' tracks have been remastered by Tim Franklin. Produced and Engineered by Tim Franklin. Drums, strings, and percussion used with permission from other Clootie songs or SFX CDs.